When we talk about dog beds most of us have pre-conceived ideas of what it should be, perhaps a wicker basket, a bean bag, a cushion, but whatever we are thinking about we probably expect it to be on the floor. Do we sleep on a mattress on the floor? For most of us, we have our mattress mounted onto a frame for better support and for better comfort. With dogs don't forget that they sleep for up to 80% of their lives so their bed should be somewhere very special. At Xtra Dog, we always want to put our dogs first and for the office dogs, Mischief and Arapahoe, it has always been a Hi K9 Raised Pet bed for them, why? These beds are raised pet beds that sit off of the floor, they have either a mesh or canvas cover so that the dog's weight is equally distributed across the bed and it is easy to keep clean, even if your dog loves the outdoors. Remember with a conventional dog bed can be a breeding grounds for fleas and bugs. These beds also don't get smelly, wow! We are also able to offer a fantastic range of accessories for extra comfort for your dogs including the ever popular Snuggle tunnel that was originally designed at the Original Hi K9 for their office whippets by co-owner Molly McKay. These raised beds have a metal frame that is coated with a material that will stop it going rusty so that it can be used outdoors in the rain or snow and the cover slides over the frame making the bed like a hammock for dogs. If your dog likes to stretch out the fabric cover extends over the edges, so that there are no corners often found in dog beds. The covers can be replaced and machine washed at low temperatures. There are two options for the cover a breathable mesh, that is breathable and idea if the dog will be using it outside or a canvas that prevents any draughts. t that they sleep for up to 80% of their lives so their bed should be somewhere very special. At Xtra Dog, we always want to put our dogs first and for the office dogs, Mischief and Arapahoe, it has always been a Hi K9 Raised Pet bed for them, why? These beds are raised off of the floor, they have either a mesh or canvas cover so that the dog's weight is equally distributed across the bed and it is easy to keep clean, even if your dog loves the outdoors. Remember with a conventional dog bed can be a breeding grounds for fleas and bugs. These beds also don't get smelly, wow! We are also able to offer a fantastic range of accessories for extra comfort for your dogs including the ever popular Snuggle tunnel that was originally designed at the Original Hi K9 for their office whippets by co-owner Molly McKay. The bed moulds to your dog's body, this will make sure that your 4-legged friend does not get any unpleasant sore spots from lying on their HiK9 Raised Pet Bed. Your dog will remain snuggly warm as no heat will be conducted from your dog's body. Due to the fact that no condensation gathers under the bed, it does not get nasty and smelly as some beds do. 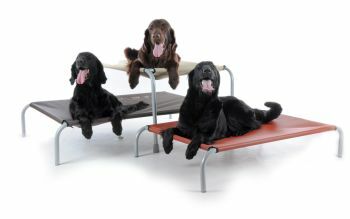 These beds are fantastic for dogs who suffer from arthritis and who suffer from joint issues. They are also ideal for dogs with skin disorders. Hi K9 Raised dog beds are also very popular with people who like to camp in tents, in caravans and those with mobile homes and RVs because they easily collapse and are supplied with a handy carry bag, this can also be handy if you want your bed to go with your dog into kennels to a dog sitter. HiK9 Raised dog beds are also used in the training arena too. Lauren Langman and Tom Mitchell developed a programme called Boundary Games that teaches a dog to target a boundary and stay in that boundary until released. 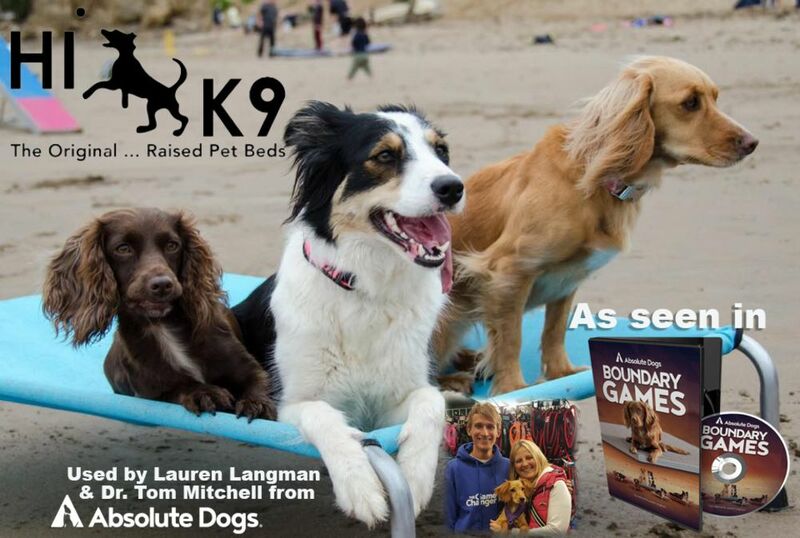 The HiK9 Raised dog beds are featured in the best selling DVD of the same name. If you are teaching your dog Bounday Games you need a HiK9 Raised Pet Bed. The Hi K9 Beds can also be used as a training aid and used to teach Bounday Games as developed by vet behaviourist Dr Tom Michell and international dog training instructor Lauren Langman.